Rev. Jan Avende has been a member of Ár nDraíocht Féin since 2009, where she serves as an ADF Consecrated Priest and Initiate. She is a talented Bard, Liturgist, and Spiritworker, who is active as a member in many of ADF's subgroups. She is also Preceptor of the Initiate Path and Magicians’ Guild, and has revised both of those programs to better meet the needs and abilities of the folk. 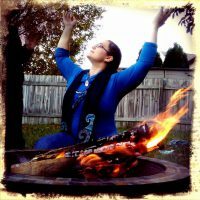 She uses her talents as a certified teacher to aid in mentoring study program students and the folk, building resources for pagan families, and making the details of Our Druidry more accessible to all. Winner of the 2015 Wellspring Bardic Chair and bard extraordinaire, she is well known for both her work in sacred song as well as covers of more popular songs. Currently she is working on writing a book on the Greek Alphabet Oracle, and is part of a small committee developing ADF's long awaited "Hearth Keeper" program. Rev. Avende works out of Three Cranes Grove, ADF in Columbus, OH, serving her local community by running High Days, moon rituals, and specialty rites, as well as providing pastoral care and assisting in the day to day running of the grove. She has begun broadening her service to meet the needs of the wider ADF community, working to build a strong online community that any can feel a part of, no matter their physical location or ability to travel. She wears many hats in ADF, sharing her wisdom, caring heart, and powerful mind. Mostly, Jan enjoys writing rituals and prayers on request, being a sounding board to help others work through struggles, and talking with others about how they practice Our Druidry. You can see more of her writing at hellenicdruid.com and support her work at patreon.com/skylark913. Rev. Jan Avende has been a member of Ár nDraíocht Féin since 2009, where she serves as an ADF Consecrated Priest and Initiate. She is a talented Bard, Liturgist, and Spiritworker, who is active as a member in many of ADFs subgroups. Rev. Avende serves her community by running High Day rites, Moon rituals, and specialty rituals, as well as providing pastoral care and assisting in the day to day running of the grove. She wears many hats in ADF, sharing her wisdom, caring heart, and powerful mind. Please reach out and talk to her, because she loves talking with others about how they practice Our Druidry. You can see more of her writing at hellenicdruid.com and support her work at patreon.com/skylark913.